That was the theme song that opened every episode of the Saturday morning live action television series “Land Of The Lost” that aired on NBC from 1974 to 1976. I love the theme song because it comes from a time when TV shows had real theme songs. A great theme song can tell you everything you need to know about a show even if you’ve never seen a single episode. 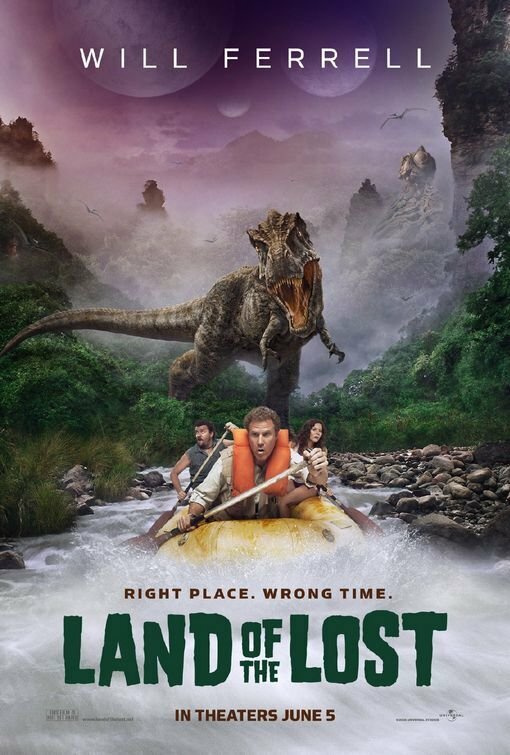 Now the theme song for “Land Of The Lost” isn’t as brilliant as the theme song for…oh, “Gilligan’s Island” “Green Acres” or “The Brady Bunch” but it’s awful close. The theme song is used in the theatrical remake LAND OF THE LOST starring Will Ferrell but to comedic effect. Which is what most of what was taken seriously in the TV show is used for in the movie: as comedy. Dr. Rick Marshall (Will Ferrell) is considered a lunatic crackpot by the scientific community. He claims that the way to replenish the world’s dwindling energy resources is to use time warps to travel to parallel/alternate dimensions and plunder their resources. To this end he has built a tachyon amplifier to do this but he’s too discouraged to use the device until he’s visited by Holly Cantrell (Anna Friel) who was kicked out of Cambridge for believing in Marshall’s crackpot theories. Holly rekindles his scientific fire and they set off to a remote part of the desert where Marshall thinks he can use his device to open a time portal. They hire fireworks salesman Will Stanton (Danny McBride) to take them into a cave that is a really crappy amusement park river ride but Marshall’s gehooka indicates that tachyon particles there are very intense. They are so intense that a time portal is indeed opened and…well, go back to the top of this review and sing the theme song. 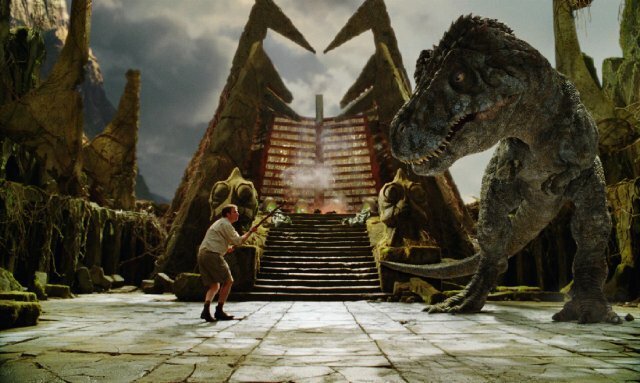 Once in the Land Of The Lost, the trio encounter characters such as Grumpy, a pissed off TRex with a surprisingly high IQ. Chaka, a fur covered missing link. And of course, The Sleestak, humanoid lizard men who were more of a threat in the television show than they are here. But that’s because LAND OF THE LOST is played strictly for laughs but it’s not mean-spirited as if the actors and the director are having fun at the expense of the audience and basically saying behind our backs how silly and stupid we are for watching this. They genuinely appear to be having a good time, especially Anna Friel who is the only cast member who pretty much plays her role straight, leaving the comedy up to her male co-stars. I liked how once the trio arrive in the Land Of The Lost she wears her hair in pigtails which I took to be a homage to Kathy Coleman, the original Holly. Danny McBride was pretty good as Will who is freaked out that Dr. Marshall and Holly aren’t freaked out by being in a bizarre alternate world on a vast desert that looks as if it were designed by Salvadore Dali. And Will Ferrell’s Dr. Rick Marshall is a scientist who would be right at home hanging out with the Ghostbusters or Dr. Walter Bishop. I suspect that Will Ferrell did this movie mostly a way to break out from the string of sports themed comedies that have put much loot in his bank account. Even though I’m not a big Will Ferrell fan as I think of him as Chevy Chase Lite I liked him in this one. I’ve read that he was a major fan of the television show and I can see that. He’s having fun with the material but he never makes fun of it. I was disappointed by The Sleestak who just stumble and lurch around and never really present a danger to the humans. In fact, there’s never a moment in the movie where I was convinced anybody was in any real danger, even when they were being chased all over the jungle by Grumpy. And there’s a villain here who plans on conquering The Earth but he’s so ineffective that again, I never for a moment thought that he’d be able to pull off his world-conquering scheme. As for the comedy…if you’ve seen the trailer then you’ve seen the funniest parts of the movie, trust me. There was never any real gut-bustingly hilarious moments and the movie is more amusing than anything else. If you’re a Will Ferrell fan you’ll probably get more out of LAND OF THE LOST than I did. Not that it’s a bad movie, mind you. It’s perfectly satisfying chewing gum for the mind and like chewing gum it loses its flavor after a while but that’s okay. You enjoyed the flavor while it was there.